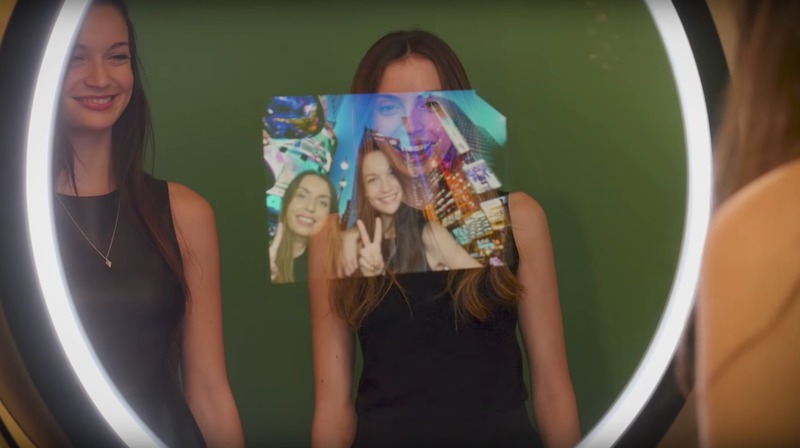 💡 Understand the Beauty Mirror: This selfie mirror is a state-of-the-art photo booth . It sets you apart from the typical photo booth at a wedding, party, or corporate event. The Beauty Mirror has an elegant appeal, and is interactive with your guests. 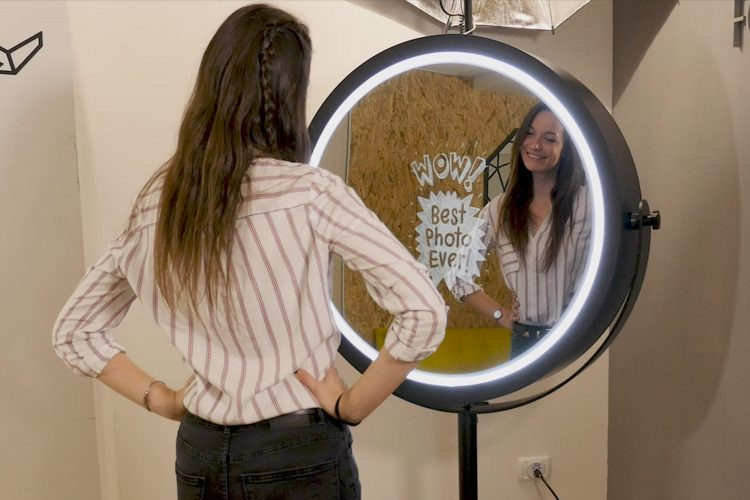 🤔 Decide: Decide whether the Beauty Mirror is right for your event. It's Elegant, Sophisticated, Fun & does not require alot of space. 🤘 Get started: Book on our website, or simply call or send us an email. We'd love to hear about your event! 💪 Work it: Amaze your guests at parties, corporate events and trade shows. Choose from countless design layouts. Customize your content. When set up, the Beauty Mirror Booth is a 69″ high, 38″ wide staggering beauty. 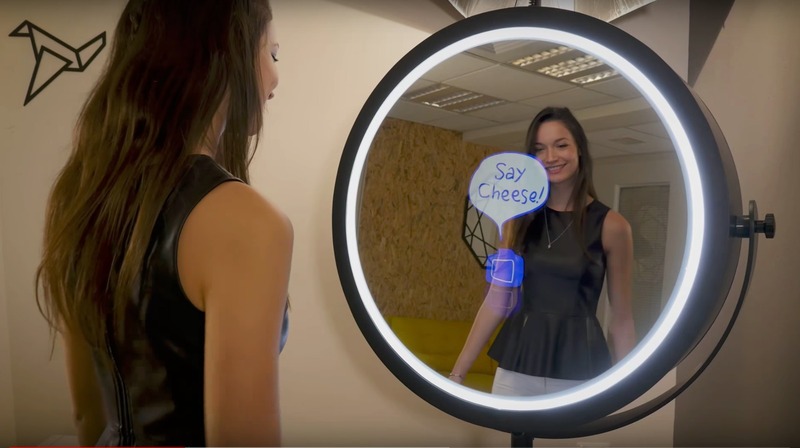 It has a mesmerizing circular LED light surrounding a 32″ mirror that displays 24″ vibrant graphic animations – a combination that is impossible to overlook. When looking at the Beauty Mirror Booth, participants see a perfect combination of their reflection with beautiful graphic animations. It feels like magic, but it is real. The clever graphic animations guide and entertain the participants through an interactive process of taking high-quality selfies, signing and stamping them, applying filters; recording a video, playing multiplayer touch-based games and finally; printing the creation as a keepsake or sharing it online. The Beauty Mirror Booth captures professional-grade photographs & videos with a Canon DSLR camera of your choice mounted from behind the glass, hidden from sight. For professional lightning, the Beauty Mirror Booth supports mounting a strobe flash, monolight, umbrella, reflector, softbox, beauty dish, and diffuser. You can allow the participants to sign & stamp their photos for the final printout and online sharing. Signing & stamping is touch-based and supports up to 6 participants getting creative together. The signing style can be customized by the participants to include a glowing neon effect and to change the stroke's size & color. Participants can also use buttons to undo strokes or clear the drawing to start over. For stamping, participants can choose and apply stamps from a selection of 100 built-in emojis, symbols, and characters. On top of the built-in selection, you can add your own custom stamps as PNG, JPG or SWF files. The Latest Interactive Photo Experience, Perfect for Weddings, Birthdays, Proms, Special Occassions, Baby Shower & Corporate Events. Dates are filling up quickly, Book Now! Copyright © 2018 Magical Mirror Photo Booth - All Rights Reserved.